Thank you all so much for your patience! I’ve been on vacation, so while I do have time to work on the chapter, yesterday I was simply too busy to have time. But anyways, let’s get started! Kaido is not bleeding. Blood in OP is always depicted as clear drops, spots and splashes (as seen when Kaido strikes Luffy). 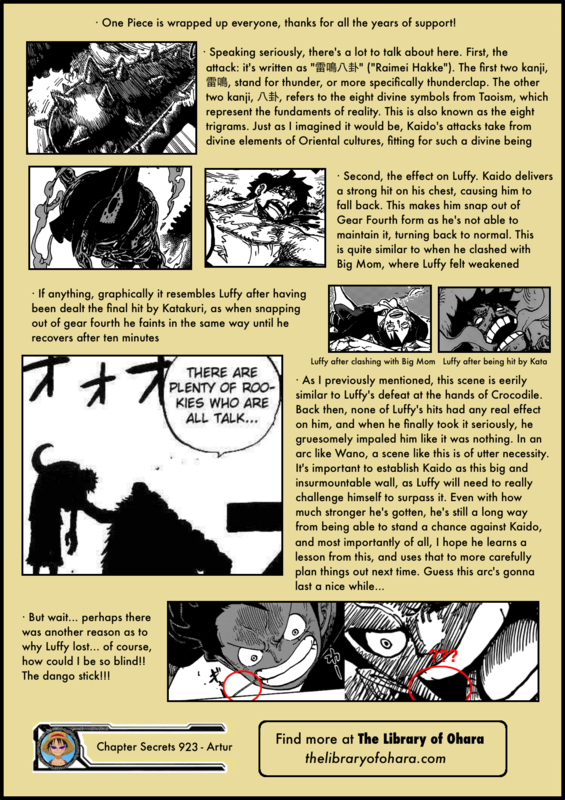 What we see when Luffy hits Kaido is a cross hatched effect that is supposed to indicate the great force of the impact. It has no real life equivalent, it’s just to enhance the visuals and give it more OOMPH. I guess you can imagine it being smoke from friction/impact or specks of dust/dirt flying off because the punches are so powerful. But Kaido has not shed a single drop of blood, not this chapter, not in the last one. Can you make a prediction as to what will happen in 924? Thanks for the review Arthur. Tama is alive, no doubt. First things first: that was one lit review, Artur, very nice. And now secondly, I can’t be the only one convinced that Luffy is gonna be awakening his devil fruit to fight Kaido, right? I mean, we know he’ll awaken it eventually and now seems like a very fitting time in the story to do so. Wow Amazing! Thanks for the reviews. Could you clarify something to me, please? You identify the gifters as the ones who have horns (or fangs?). Kaido has them too. But what are those Do you have an idea? I was with the misconception that it was a result from smile. But Kaido (who supposedly has I Akuma no mi) has them, while Momonosuke, Speed and Hold’em, who are smile users, don’t have. Was just me who was relating the horns/fangs with smile? So…If you’re not a monster yourself Zoan can add some flavour on you but if you ridiculously storng Zoan actually makes you weaker? We’re after-time-skip-TB-arc and we got a beaten luffy similiar on arabasta. Everything seems to indicate Kaidou got beaten with a clear weakness but not easily fall of course. Even Enel that got almost nothing able to do on Luffy give some hard time. I don’t think that the Zoan fruits make them weaker. Each form has a weak spot and a strong feature. Take Chopper for example: his hybrid (regular) form is better for analyzing the enemy, but is weak in battle; his animal form is the fastest one, but have no physical strength; his “human” form is strong, but not very agile (and is big, making it easier to hit); defense point has the best defense, but no attack; kung fu point is balanced and good for fighting; monster point has a huge destructive power, but isn’t very agile and is easy to hit. The same goes for Jack and Kaido. In animal form, they lost agility and are big, making them easy to hit and, probably, as Arthur pointed, weaker in defense. 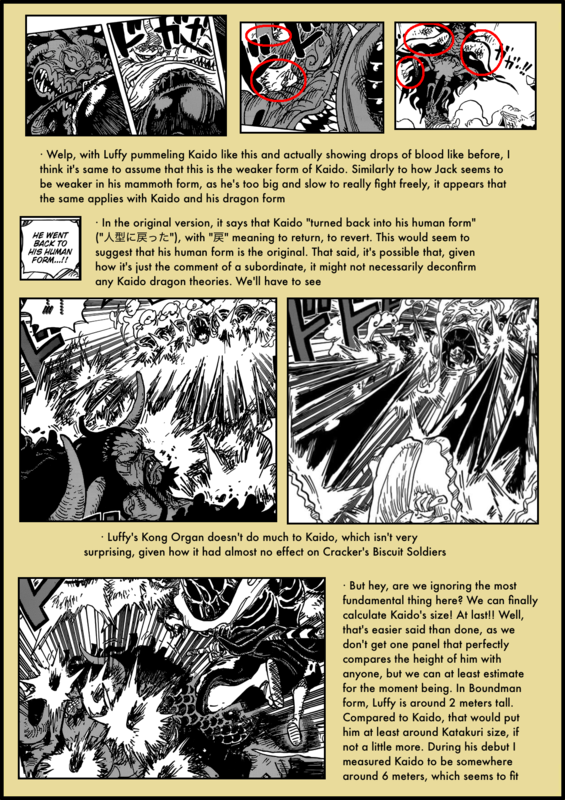 However, they gain a massive strength and destructive power and, in Kaido’s case, a very powerful special attack (Boro Breath). So, Zoan is a balanced fruit, that gives 3 transformation: human, animal and hybrid (looking forward to see Kaido’s and Jack’s), which having advantages and disadvantages comparing to others. In fact, it goes to all Akuma no Mi in One Piece. Every one of them has a weakness (a very evident one is Black Beard’s, which absorbs all damage taken, making it more effective). So far, Luffy won many battles learning how to explore this weakness, as he did with Crocodile, Enel, Moria, Bellamy and Cracker for example. 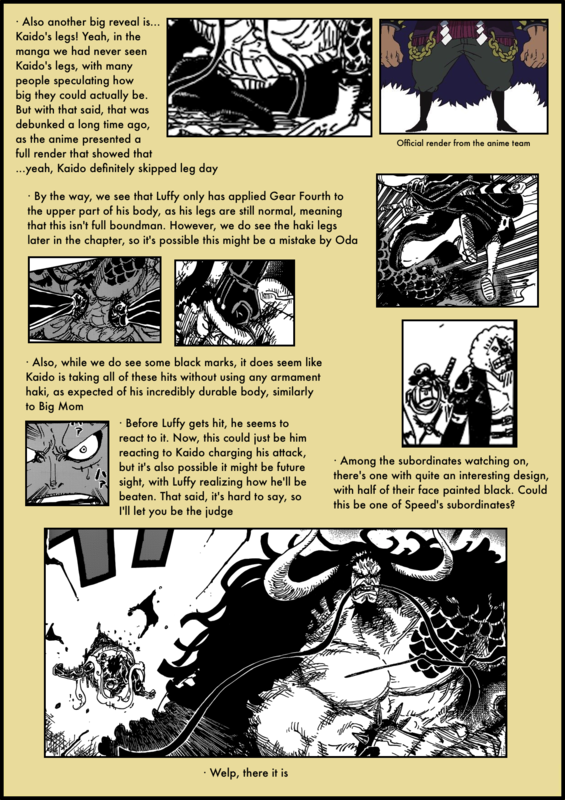 I think kaido used coc haki that overwhelmed luffys just loke big mom and that is what made luffy lose his gear fourth form and thats how kaidos saying “you a pirate king?” fits. It would be funny if it turned out that Kaido actually barely uses armament haki defensively or at all, since he cant die he just havent had a reason to develop it at all, meaning that the punches threw might have hurt a bit but he immediately recovers anyway. I totally missed the ninja there, hoping to see a bunch of them throughout the arc. I rly like your reviews, so pls don’t get me wrong on this. 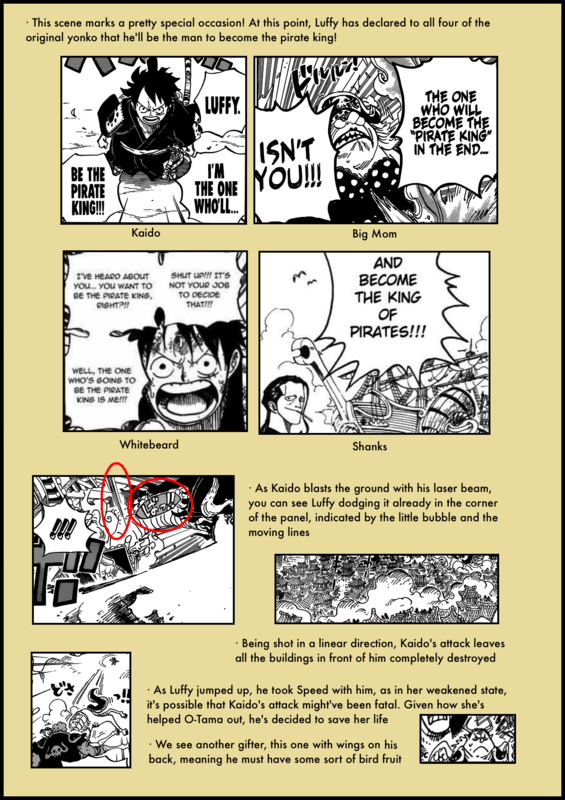 When you explained how big Kaido could be when compared to Luffys Boundman, I think you made a mistake by stating that Luffy is around 2 meters tall. 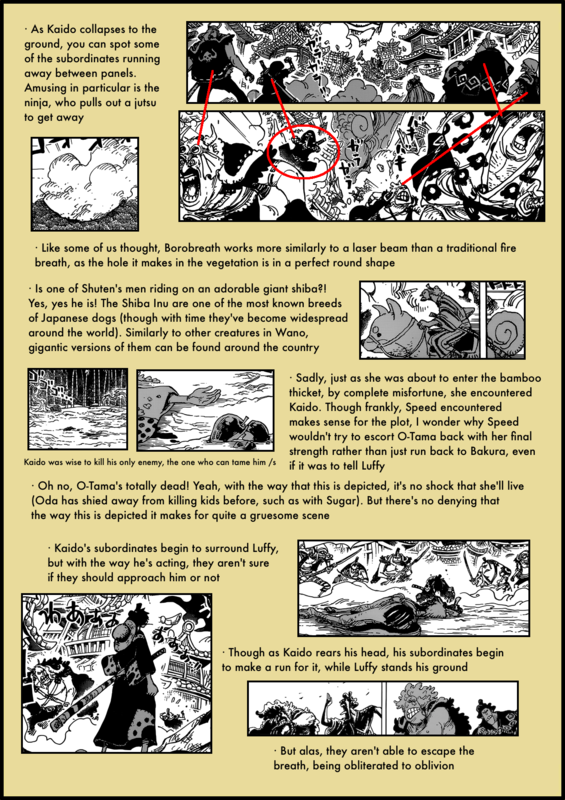 Back in Dressrosa someone said he thought Luffy is at least 8 meters tall but he was only about 4 meters in Boundman which, considering all the comparisons we’ve got makes quite alot of sence. Maybe you just misspelled it, but anyways wanted to draw your attention to it. Thanks for the hard work as always. Love the little note about the title not giving Luffy any position! Though of course I’m sad to see Luffy get beaten so bad, I’m stoked about the last couple chapters. Anything can happen from this point–though we know how tall the wall is now and we know he’ll have to power up, we’re no longer in the realm of the predictable. We know that Luffy will develop every fight. Arthur, I know what I’m going to say here will not be long. But there are some points I want to put. I believe that in the next manga Luffy must be arrested and there to meet the Kid and who knows some more prisoners and there to be able to architect a plan. The bow should take a new turn where the goal will be to rescue Luffy. Artur imagines when Big Mon arrives already imagined? My head is a thousand. I believe that as Oda said the Marineford war will be small compared to Wano. I believe that the revolutionary exercise should arrive. What about Reverie? Do you think you should show something or just at the end of Wano’s bow?